After using synthetic tents for the past 25 years, I decided to go back to canvas. 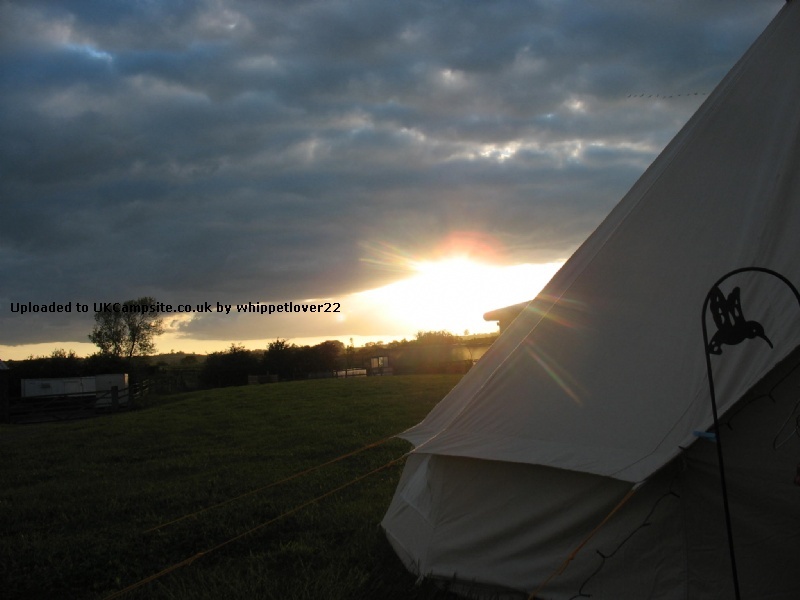 After reading up on Bell Tents, we viewed and bought a 5m Bell Tent from Bell Tent Boutique in Notts. Just to add that the service from BTB was amazing. Great advice and even 'ordered' us home to go think about it. What more can you say? 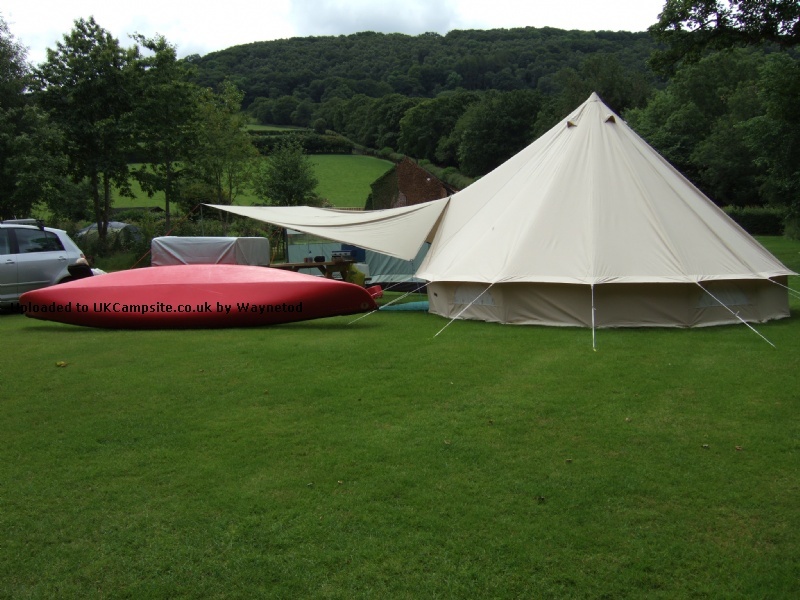 After a trial run on the back garden and tied all the guys on we headed to the Matlock countryside to christen our new tent. Taking it steady, it took just over 18 minutes on my own to pitch. One pole in the middle and an A frame for the entrance. Easy peasy. Was brilliant for me as the better half could concentrate on our 8 month old lad. The tent from the out side doesn't look that big visually though once inside its massive, two double air beds with a travel cot and room at the sides. Just in one half of the tent. Impressive. We nicknamed it The Tardis. The lights which shine through the canvas in the morning was a lovely sight. At the top of the center pole there is a ring for hanging light(s) to which we hung the free gift, a tea light hanging chandelier which was a lovely touch. There is 4 zip windows around the tent with mesh to keep the bugs out and let air in if its hot. I like the fact that you can unzip the groundsheet and roll the sides up if we get a hot day. The doors have mesh screens separate which I like. We had some sun, wind and heavy rain while we was away including one storm that had rain drops, that were quite big, hitting the tent with force for about half hour and not a drip came in. After my last leaky new Vango, an absolute bonus. Id confidently take this tent in any season. We bought ours this year, and have used it for 10 nights so far-it is truly impressive! We have the inner with ours, so that our 8 year old has his own room, and its a lovely place to be. No condensation and loads of room are the main advantages, plus its very quick to pitch and knock down. The central pole is a very handy place to hang a lantern from too-we have a piece of wood with a half-moon notch cut out of it which fits onto the pole, and a length of rope which goes round the pole by a clove hitch to the outward end-so the lanterns high and out of the way. As for weatherproofing, we have camped in gales and a severe thunderstorm and it was fine=just make sure you tuck the groundsheet in properly. Its expensive but we will get a lot more use out of this than a normal tent I'm sure. Easy and quick to erect and just as important, it`s quick to pack away too. Will keep out the worst rain that Wales can throw at it and even though some might think that a separate groundsheet will leak, it won`t. We use a cheap 18`x12` blue tarp, folded in half as a footprint to keep the worse of the mud off the groundsheet, (just remember not to have any blue tarp sticking out further than the groundsheet) and a Tatonka tarp as a shelter/Malu. The quality of the tents from Belltent/Oberlink is just about right, a heavier canvas is going to need a lot more effort to erect and a heck of a lot more to put away if it`s wet. 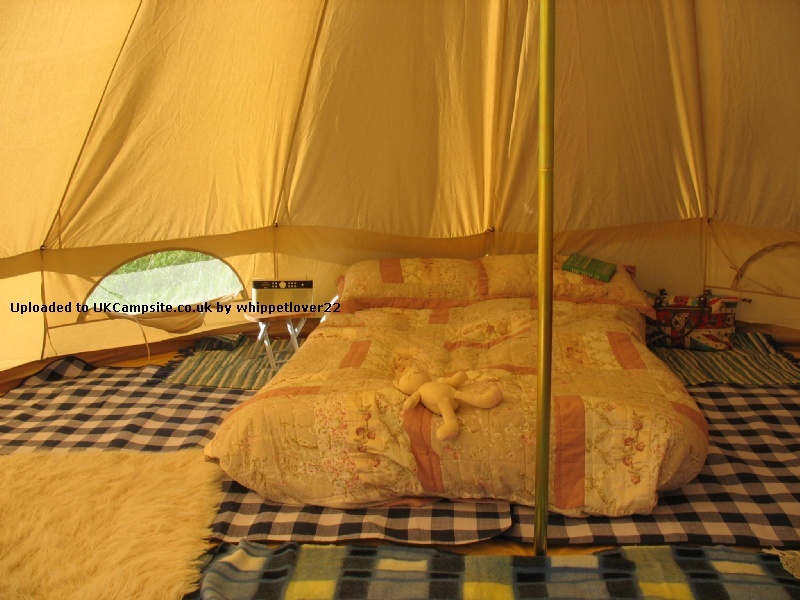 A 5M Bell tent for 2 people is palatial and if your going to want comfort, it`ll be hard to beat. 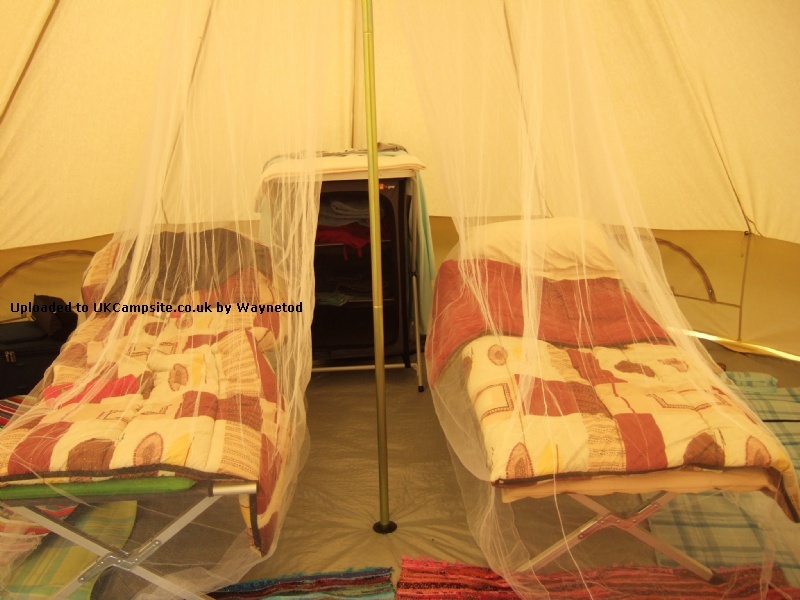 We use 2 camp beds with SIMs on top and mozzie nets instead of a bedroom pod (which takes up too much space) to give it a Safari feel to it. These nets were hung from the pole and over the beds and are wound around the centre pole when not in use. It works for us as my wife does n `t like the thought of insects in her face when sleeping and for about �5 each on evilbay, a saving of over �100 on a bedroom. Quite light inside if there`s any lighting outside the tent at night and easy to see your way to the Kampa Khasi in the dark. Negative points?. Cost a lot more in the UK than it does in the Netherlands and that`s it. Roll on the 'Loire' next summer. We are a large family with 5 kids. Unusually for a family we wanted a tent that does not have separate rooms. We found our younger kids got scared at night and we all ended up piled in 1 bedroom last time we camped.Not fun! 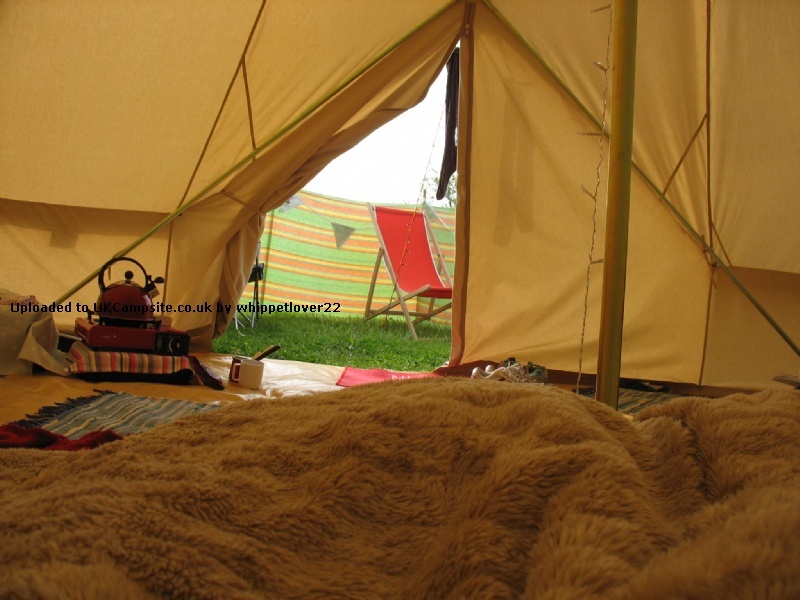 After much research we decided on a bell tent and we have not regretted it so far. The tent is massive, sleeps all of us easily. My husband and I sleep on a king size air bed and the children are on roll up beds on the floor. We still have room for a couple of blow up chairs and all our stuff. We did add an awning made of a tarp and a couple of poles, just to have somewhere outside but under cover. The tent is good quality, easy to pitch (once you have tied on all those guy ropes!). It only takes us a few minutes to put the tent up, which means we have plenty of time to make it a home from home before the kids become to fed up. The space is mostly useable and being able to stand up in the tent is a great bonus. We found sleeping in the tent comfortable, not at all muggy or damp in the morning and the best thing is that it didn't leak even very bad weather. We added a tea light chandelier which we were very sceptical about but it really does give a lovely light and warms the tent pretty well. Taking the tent down was easy, of course you will need to dry it if it gets damp, but we hung it over the banisters for a day or so once we got home and it was fine. 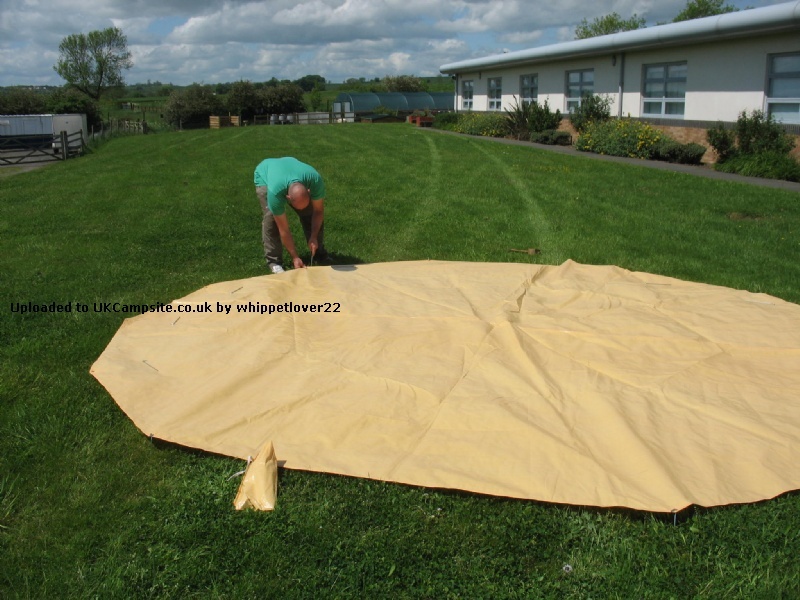 The separate ground sheet is great when you are taking the tent down somewhere mucky or wet, you can lay the canvas part on the groundsheet before you unpeg it to help keep everything clean. The one small niggle is that the separate ground sheet is a bit fiddly to marry up with the rubber edge of the tent, but once it's done it's fine at keeping water out, if not bugs and the odd caterpillar! A great tent that gives a unique camping experience very different to most modern nylon tents. Easy to erect, really spacious, secure and weather proof. We bought ours before they added the fittings for the optional inner tent but we have never felt the need for this. Cool in hot weather and condensation is never a problem. We love the optional tea-light chandelier which hangs from the central pole. This gives plenty of light and a little warmth to the tent. I like the flexibility of a separate groundsheet, no need to sweep tent, just give the groundsheet a shake before packing. Keeps the weight down and makes drying the tent much easier. But if you don't like the odd creepy-crawly them you may prefer the sewn-in groundsheet. Personally I am happy to share my space with all of nature. 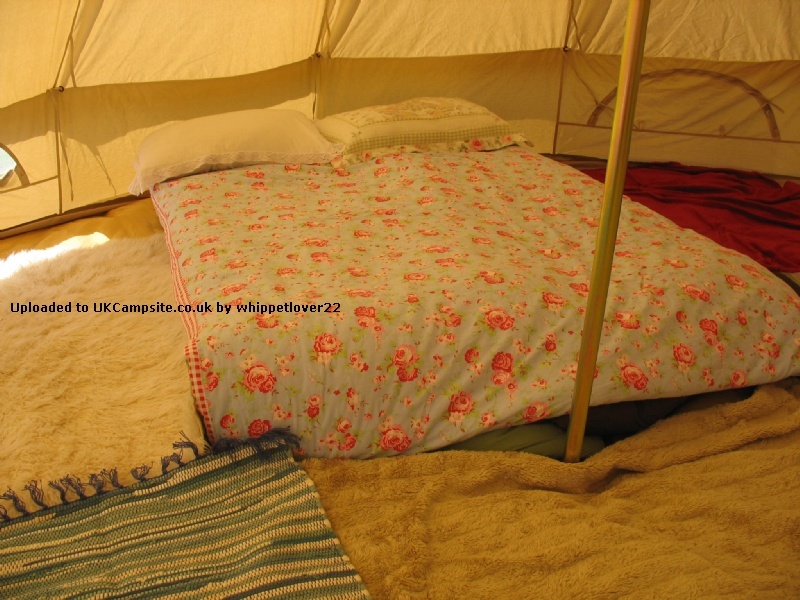 Bell tents also sell a stove which will fit inside the tent with a flue through the side wall. This was a big selling point for us but we have yet to purchase this. 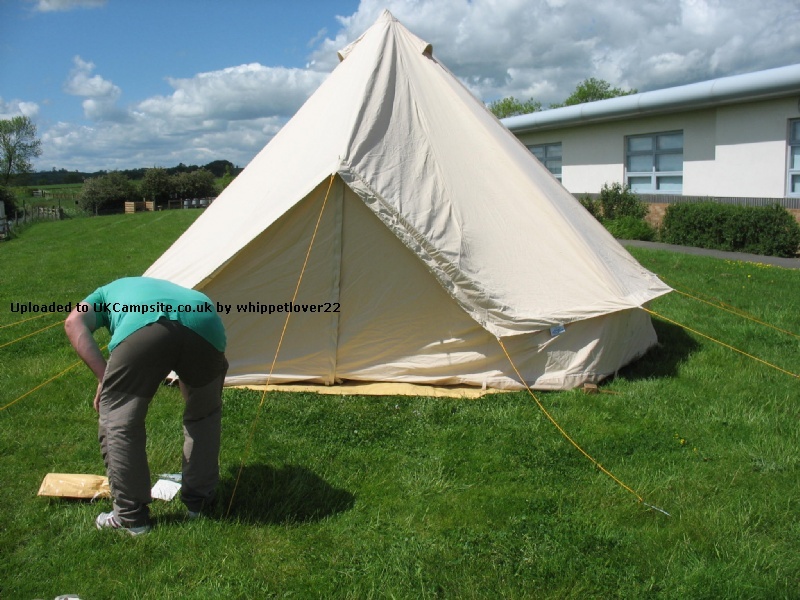 It is a bit expensive �400+ and looks very small for heating such a large tent. For the moment we use a simple wood brazier outside the tent. This tent easily sleeps 8 but you will need to pack away sleeping bags and mats to make room for living space. Unless the weather is really foul we use the optional malu awning which gives space to cook and sit outside. The tent appears well made and durable. I suspect the weak point will be the apex. This is triple (or more) skinned and the pole has a soft rubber cap to protect the canvas so should last many years. I am sure it will last a lot longer than a modern dome tent. Add your review of the 5m Standard! 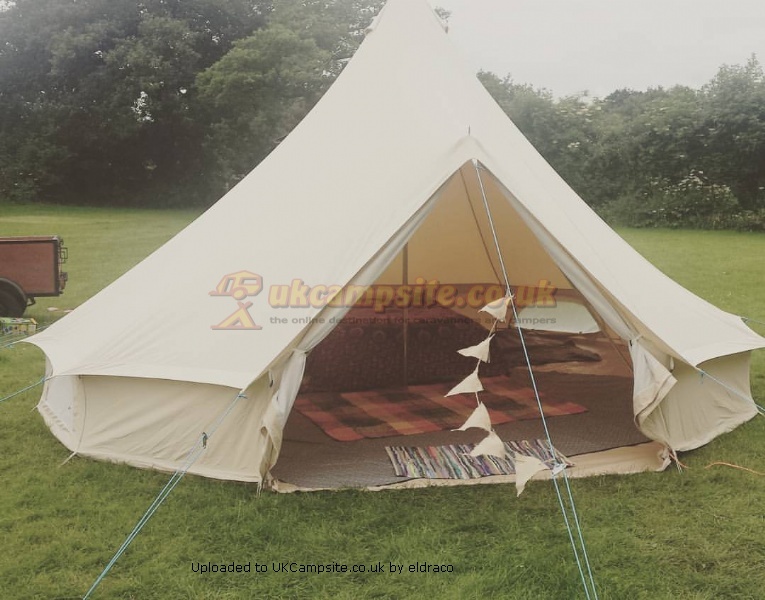 This is the basic 5 metre diameter Bell Tent with separate groundsheet as opposed to the deluxe with sewn-in groundsheet or the ultimate with zipped in Groundsheet (ZIG). �Sides roll up on hot days to let the breeze through. �All of our Bell Tents have all the loops and attachments to fit one of our Inner Tents should you decide you want to add one. �Has a metal hoop on central pole, great for hanging things from. 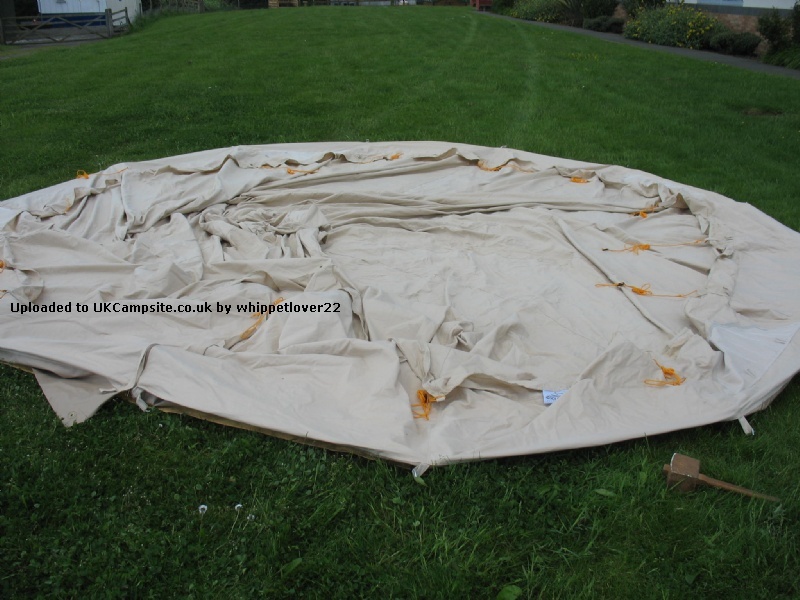 �Waterproof groundsheet is octagonal, made to measure and is pegged down to stop it being blown about. 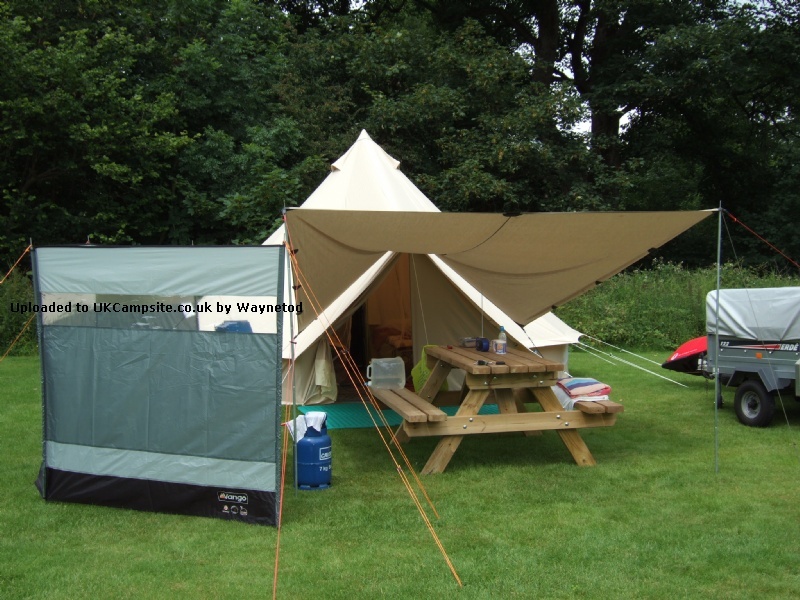 �Can be fitted with our specially designed Bell Tent Uk stove.